Heath are having a very good first season in the Bostik South East Division after gaining promotion from the SCFL last year. And despite appearing to be pushing for the play-offs, Saunders made it clear he only has one thing on his agenda. He said: "We are taking it [Hythe Town result] as a point closer to safety. That’s the agenda. "Until we get enough points on the board that we are mathematically safe and are not being sucked into any relegation battle, we are treating every game as one we can pick points up in so we are not looking over our shoulder during the run in." And Saunders saw the goalless draw at Hthe as a point gained. He said: "Bearing in mind we had some illness and a couple out and they are competing, I would say it was a point gained. We played really well. "I noticed on twitter their keeper was in the Kent team of the week so that tells it’s own story. "We went there and we changed the way we set up to be compact and we were to a man. We were on our game Saturday and it could have gone our way, we had a goal disallowed for offside, which I would like to see a video of. "But it was a fair result. Both sides had chances and for a 0-0 it was a really good game to watch. Normally there’s nothing to say about a goalless draw, but it was a real good game." 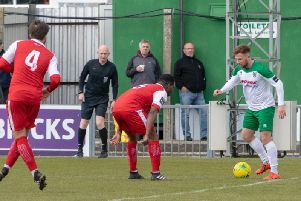 The draw meant Saunders' men have not won in three games, following the draw with East Grinstead and the defeat to Ramsgate, but that does not concern the manager. He said: "The draw and the loss were disappointing because it was stoppage time goals in both games which cost us in both. "If you had asked me before we travelled to East Grinstead if I would taken a point, I would have said yes. But if you are in the 93rd minute and you concede an equaliser, of course you are disappointed. It felt like a loss. "Against Ramsgate, we were a bit naive. We were 2-0 down, got it back to 2-2 and we should have seen it out for a point but we went for gold and got caught on a counter. "I am more than happy with our form, we have just been unlucky not to take more points out of the last three games. "If we keep playing the way we are playing we will be fine."